Jaga Radiators are at the cutting edge of LST Radiator Design. 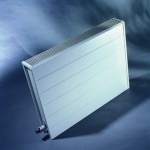 The Two Low Surface Radiator Ranges Trenchstyle sells are the Jaga Guardian and Jaga Tempo. These great LST Radiators utilise Jaga's Low H2O Technology which is a low water high efficiency radiator system. Jaga are renowned for being at the cutting edge of radiator technology, they combine innovative LST heating design, premium materials and market leading warranties, in radiator terms this makes an unbeatable combination. 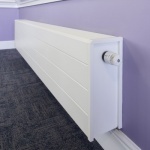 The Jaga Tempo and Jaga Guardian Low Surface Temperature Radiator Models are available in a variety of sizes and heat outputs, the heat echanger can be fitted as twin or single models within the same size LST Cover unit depending upon the BTU heat outputs required. Casing depth can often be critical in central heating installations and Jaga provide slimline heat exchangers in single and double to provide great heat outputs even on slimline models. So if you're looking for a Jaga Low Surface Temperature Radiator, Trenchstyle is the place to come. We are the Premium Seller of Jaga LST Radiators and provide free delivery on these superior LST models.